A two-story pedestrian bridge will rise over Clifton Road this month as Emory University Hospital continues progress on its new, state-of-the-art hospital tower. The bridge will be constructed in the center lanes and lifted into place. 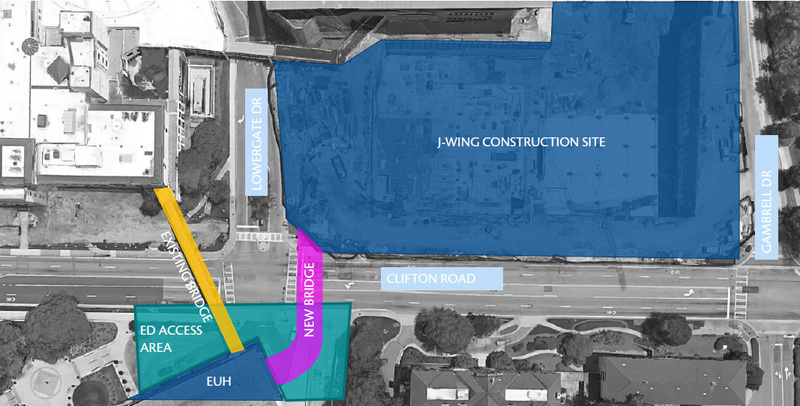 CLICK TO ENLARGE: The new bridge will connect Emory University Hospital to its new J Wing. Once it is operational, the current pedestrian bridge will be torn down. • When traveling to and from Clifton Road during this time period, be sure to plan for additional time. • Pedestrian access will be affected during the bridge installation weekend (July 22-24) with detours along the Clifton Road work zone. The existing pedestrian bridge across Clifton Road will remain open. • Safety is the No. 1 priority. Please follow the signs posted and any directions provided by individuals guiding traffic during this construction process. • If you have meetings scheduled July 18-24 that require participants to travel along this section of Clifton Road, please consider rescheduling, relocating the meetings off campus, or conducting the meeting via tele-conference to reduce the traffic congestion associated with temporary lane closures. A two-story, steel and glass pedestrian bridge will rise over Clifton Road this month as Emory University Hospital continues progress on its new, state-of-the-art hospital tower. The bridge, which will connect Emory University Hospital with its new J Wing, will be constructed in the center lanes of Clifton Road and then lifted into place, becoming another landmark for the Emory campus. Slated to open by next summer, the J Wing will feature nine levels and 450,000 square feet, including 210 patient beds, patient care units for cancer and transplants, ICU rooms, and diagnostic and treatment spaces. The new bridge will connect to the main hospital on both the second and third floors. Once it is operational next spring, the hospital's current pedestrian bridge will be torn down. Construction and placement of the new bridge will have a significant impact on traffic on the section of Clifton Road between Gambrell Drive and Uppergate Drive, so those who travel Clifton Road should plan routes accordingly. Please note that these dates are subject to change, depending on weather or other factors. July 15-17: Over the weekend, the two outer (curbside) lanes in front of Emory University Hospital (EUH) in each direction will be restricted to allow delivery of the steel columns that will support the bridge. Travel on Clifton Road in both directions will be limited to the two inner lanes. Access to the hospital or clinics will not be impeded by this work. July 18-22: During this week, the three center lanes will be restricted to allow bridge construction, which will take place on site in the middle of Clifton Road. (Onsite construction is necessary because the bridge, which will weigh approximately 150,000 pounds and span more than 130 feet, cannot be moved very far once it is built.). Cars will continue to have access to Clifton Road in both directions but will be limited to one outer lane in each direction between Gambrell Drive and Lowergate Drive. Police officers at main intersections will direct traffic to help maintain traffic flow. Staff should limit their use of Clifton Road during this week. July 22-24: Beginning Friday evening and continuing over the weekend, the bridge will be raised, resulting in restricted access along Clifton Road from Gambrell Drive to Uppergate Drive. EUH valet and patient discharge operations will be relocated to Emory Clinic A valet and will be staffed with additional transporters to assist in patient/visitor movement to and from EUH during this time period. Only Emergency Department drop-offs and ambulances will be allowed onto Clifton Road in front of EUH and the surrounding areas. Access to the parking decks and buildings will be from the roads behind Emory Clinic. August - late fall: Additional work on the bridge during this time may necessitate some restricted access (e.g., a lane closure), but you will be able to travel on Clifton Road.